Re: Boot opening/closing problems anyone? The only problem I have had is sometime it will not closes on the remote despite the lights flash so it is getting a signal. Sometimes it can be 2-3 days of not working then everything is ok for several weeks, have tested with all remotes as does the same with all of them so it is not a remote issue. Have not got to the bottom of it yet. been to dealers today for first oil change. while there asked them to check the boot open and closure. The problem i am having is if the keys are in my pocket and the boot opening button on the fob gets pressed while im away from the car, like the other day i was in the house and the fob got pressed it opened the boot but unknown to me till i happend to look out of the bedroom window and saw it was open. so i tried to close the boot from the bedroom window and it would not close. this has append a few time and the only way to get the boot to close is virtually stand next to the boot and press the button on the fob. which is defeating the object might as well press the button on the boot. While at the dealers got the technician to try it, we stood in the show room about 15 meters away and the boot opened then told him to try closing it and it wouldn't close we had to go out to the car and virtually stand next to the car then it would close. So he checked the instruction manual it says should work up to 30 meter away if not could need new battery, so he changed battery tried again and still wouldn't close from inside the show room. so problem still not fixed going to have to wait now while he contacts tech support to see if there is a solution to this. Wounded if anyone has had same issue and it got fixed, or could someone try opening and closing their boot from some distance see if theirs works and let me know, if it does i got some ammo when i return to dealers. The main doors work ok they open and close from a distance its just the boot has a problem. Tried this on mine and found same thing ie long press on fob boot opens but long press again and it will only close if you are close to car. Perhaps a safety feature to reduce chance of closing boot when someone underneath ? just seems pointless it can open from a longer distance manual says 30 meters but only close when closer. Few times now my boot has been opened without me knowing while fob in my pocket and iv been inside the house only lucky nothing been stolen out of the boot or car, or even the motor stolen this needs sorting. This is my solution to the problem. Clip it to belt or belt loop. Never operates in error and you don't have to fumble in your pocket past all the loose change, keys and what other junk we chaps have in our pockets. Is it possible to disable the button for the tailgate on the key fob perhaps? Or is there a dealer fix to disable the keyfob from opening the boot? I'm happy with the kick my foot underneath to open/press the button, but I'm heartily sick of the thing trying to close on my head while I'm loading gear and the key is in my trouser pocket or my neighbour telling me my car boot is open. UK. Diesel AWD DSG 190 Edition. Having just come back to my car at a supermarket and seeing the boot wide open I decided to fix it. I've managed to 'fix' it permanently by doing a tiny bit of surgery on the key fob and now the boot button doesn't do anything. If anyone's interested in how, I'll get some pics together and post them up. 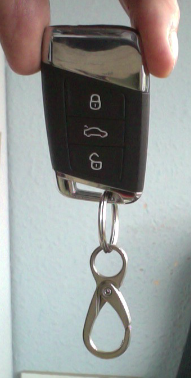 In short, I took the key fob apart and used a scalpel to cut off that little plastic nub that pushes the switch inside the body of the key fob - now when I press the boot key there's no 'click', but equally, there's no risk of unintended boot opening! It was a bit fiddly and you need a Torx t5 screwdriver, but very do-able. When it comes to getting rid of the car I shall superglue that little bit back on...so long as I don't lose it in the meantime! I do hope that solves your problem. My boot has opened, only once, luckily and it was NOT caused by the fob. Still a mystery!. Yesterday and today..... In spite of having the tailgate manual 'handle' replaced under warranty it has been in-operative twice in two days. Also the fob opening has also gone wrong 3 times in two days. Opening only to the halfway point . I really don't see why I should have to do a 40 mile round trip to my dealer at my expense and waste of time, (3 times now) to get this sorted, when it is a warranty problem. Yes, I know I have a Skoda dealer in Bournemouth, but they are part of a group I would not deal with under ANY circumstances. Since I have had the car for 18 months and I normally change every year I think it is time to say goodbye. But what theL do I replace it with? NOT a LR, that's for sure, Nor a Hyundai and certainly not a Kia as I intend to keep my spine intact for a bit longer! I don't think Kia have heard of suspension!! I shall be so sad to see the back of the K in some respects as it is the best driving Skoda I have ever owned (out of 5) but the niggles and poor build quality are driving me round the bend. If I do decide to get rid my Racechip XLR will be for sale here. My dealer has offered me £21,000 for the K against a Mitsubishi Eclipse Cross or a straight purchase. So I will have lost £8,650 in 18 months. hey-ho! Can't take it with me!! My boot has operated twice unintentionally since I got it in July. 1st time was as I got into the drivers seat. I saw the flash of the indicators, and heard the tailgate unlatch but then stop. Keys were in my pocket and the pocket was pretty tight so I'm 90% sure it was that. Second time I know for sure I pressed the button as I I leant against the tread of a ladder in the garage, felt the key fob in there and then heard the tailgate open. Regarding the range limiting for closing, maybe it's intentional, to make sure you are close by to 'supervise' while the boot is closing as maybe they think there is more chance of someone being caught by it closing than opening? Personally I would have specified without. I can open a tailgate put something in and close it again before a power boot is even open. It's like Kessy. I specified it as an option on a previous car and while I found nothing to dislike I would not have ordered it as an option as I see no benefit. When are we getting power close doors? You know, so you only have to push the door gently to the first click, then they are pulled closed! Have to buy a Roller for that!! I have got a new Kodiaq delivered in April 2018. It has been 10 months and I am having boot opening /closing problem. The dealer wants to charge 170 GBP and mentions it is not covered in warranty. I am bit surprised with this. Do I have any options?